I'm so dang proud of her! Preheat oven to 350�. Put 1/2 cup butter in pie pan and heat until melted. Remove and add crushed chocolate crackers and mix together. Press in the bottom and up the sides of pan and bake for 10 minutes. When it comes out immediately put 2 T. peanut butter and spread it around the bottom of the pan. Cool completely. In a mixer whip cream until fluffy. Put in a seperate bowl. Now mix put cream cheese, peanut butter, sugar, butter, and vanilla. Beat until light and fluffy. Fold in whipped cream. Spread over crust and chill. Top with chocolate bars, whipped cream, or drizzle with chocolate sauce. Yumm! 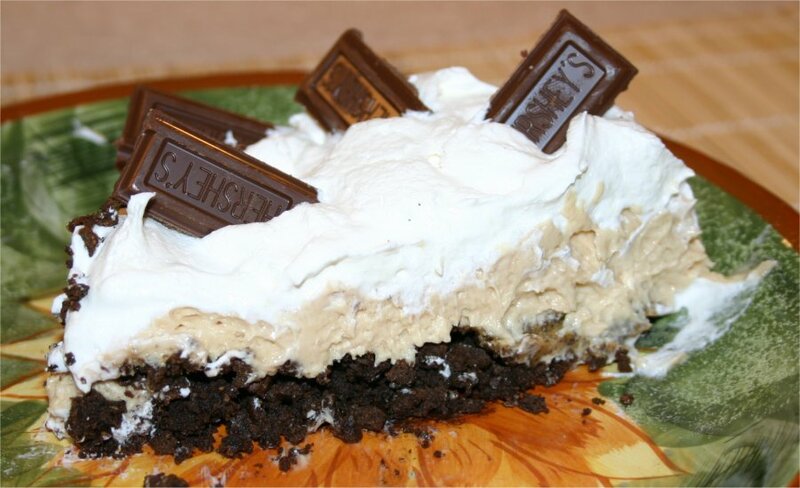 Click here to download Peanut Butter Pie Recipe to Cook'n.